Landscape Use: Dense shade tree for xeric landscape design themes. Form & Character: Round and spreading canopy, rugged, leathery and coarsely branched. Growth Habit: Woody, evergreen perennial tree, moderately-fast growing to 30 to 40 feet with greater spread. Prolific producer of basal trunk and root suckers. Foliage/Texture: Alternate, leathery, even pinnately compound leaves, 4 to 6 inches long, leaflets in pairs of 2 to 3, leaflets are orbicular to obovate, petioles and rachis are reddish; medium coarse texture. Flowers & Fruits: Carob tree flowers are bisexual, yellowish green maturing to red in color, and are arranged in short lateral racemes during the late fall and early winter on short inner spur branches of the tree. Often flowers exude a powerful musty fragrance (like dead fish, wet dogs, or that musk perfume that some of the granola mamas from northern California wear). Carob tree fruit are a flattened, twisting, and elongated pod to several inches long, green when immature but then maturing to a dark brown color. The pulp between the seeds inside mature fruit pods is edible, tasting like chocolate. Temperature: This tree thrives in the heat of the lower desert. Soil: Tolerant of moderate soil alkalinity, but will show foliar chlorosis in alkaline soils if the soils are chronically wet as might be the case around lawns. Watering: Though drought tolerant, carob tree must have at least some deep, but infrequent irrigations during summer. Pruning: Conservatively raise the crown base as needed and remove any epicormic shoots (sucker growth). Disease and pests: Trunk, crown and root wood rotting fungi are common. Additional comments: Carob tree is a wide spreading tree. 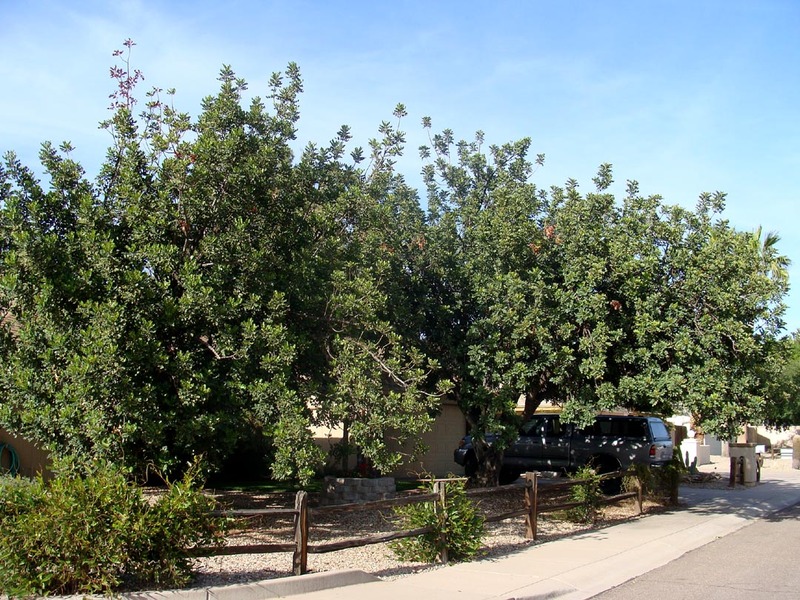 In Phoenix, carob tree is one of the best trees for casting a dense shade where water resources are limited. Carob tree does however have a "few skeletons in it's closet". It has roots that are known to be invasive and it's flower, fruit and leaf litter can be a debris problem in this age of the 'immaculate landscape'. It also has the potential in the presence of canopy cover and moist soil to reseed in Phoenix urban landscapes. Presently, carob tree is not popular in the Phoenix nursery/landscape trade. My guess is that it comes from the 'wrong' desert. Commercial carob chocolate is derived from the fruit pods. The carob tree fruit are sometimes referred to as "locusts" or "St. John's Bread." The Bible records in Mark 1:6 that John the Baptist ate "locusts and wild honey" as part of his simple vegetable diet. Also, the husks that were eaten by the Prodigal Son in Jesus' parable (found in Luke chapter 15) were discarded carob pods. Even today carob continues to be an important feed for livestock. The word carat, which is still used today to measure gold and diamonds, comes from the Arabic name for the carob seeds because of their uniformity in weight.